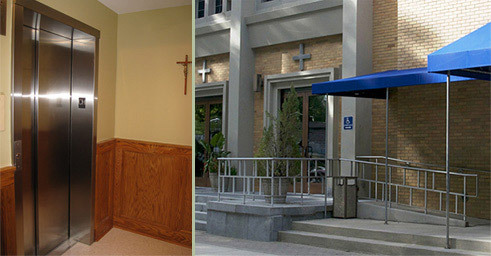 Our Church is fully accessible to persons with disabilities, with an elevator, a ramp and an automatic door opener. Inside the Church, there are specially designated areas with comfortable upholstered seats intended for persons with disabilities. Eucharistic ministers bring Communion directly to those who are seated in these special areas. For those who are hearing-impaired, there is a digital sound system with assistive listening devices available for use. Please check with the sacristan in the Church. If you or someone you care for has a disability, we hope to be of assistance in any way possible. Please call Parish Social Ministry at (516) 352-5904 or e-mail us at lindaleone@stannesgc.org.